If you love pickles—whether sweet, dill, garlic, or bread-and-butter—you should be using that delicious leftover pickle juice for other things once they're gone. Here are a few suggestions. Any recipe for homemade salad dressing that calls for vinegar can be made extra tasty by substituting pickle juice. In fact, you can substitute pickle juice for most recipes that call for vinegar, like gazpacho, or add extra pickle juice along with your pickle relish in potato salad, macaroni salad, tuna salad, or deviled eggs. Once the pickles are gone, take that jar and fill it with other fresh vegetables: carrots, peppers, broccoli, beets, cauliflower, or onions. Place the jar back in the refrigerator, and in a day or two you will have tasty pickled raw vegetables. In large pieces, they make great snacks. In small pieces, the resulting homemade relish can liven up salads, sandwiches, hamburgers, hot dogs, or tacos. The pickling process also works with hard boiled eggs, if you can squeeze them into the jar. Soaking meats in pickle juice before cooking will tenderize the outside (which, due to complex interactions, gives the impression of more tender meat) and add flavor. It works for chicken, pork, or beef. Depending on your taste, you may want to use it full-strength or diluted with water or milk. You can also marinate vegetables in pickle juice before baking or grilling. Discard the marinade after one use. Many people add lemon juice to fish while cooking or at the table, but you can substitute pickle juice for a new and different flavor. It'll add a vinegary zest to any kind of fish, although if the pickle juice is colored yellow, you should dilute it with water to avoid turning the meat yellow. Make your own tasty rye bread for sandwiches, using dill pickle juice for flavor. It's the key ingredient for a slightly tangy edge to a loaf that's ready to be slathered in mustard and piled high with pastrami, Swiss cheese, and sauerkraut. Frozen pickles on a stick are quite popular in some areas, particularly Texas. They even have snow cones topped with pickle juice! You get the same kick with frozen pickle juice on a stick, sometimes called a “pickle sickle.” You can make them at home with mashed pickles or with juice only. This recipe for pickle soup uses both pickles and pickle juice on top of potatoes, carrots, and onions, as well as sour cream and extra dill. How could that combination be anything but delicious? If you normally add lime, tomato juice, or clam juice to beer, a spoonful of pickle juice will only make that concoction tastier. A dash of pickle juice is also recommended to spice up a Bloody Mary, and there's always the Pickleback, which is a shot of whiskey chased by a shot of pickle juice. This is a popular method for “improving” cheap whiskey, although if you like it, you might even want to try it with tequila. Last but not least, be sure to try out the Pickletini, a martini made with pickle juice. Pickle juice in water is also a popular substitute for sports drinks, because it contains plenty of sodium and electrolytes with less sugar than commercial sports drinks. There is some evidence that it can help with muscle cramps, too, and some baseball pitchers use it to ward off blisters. If you have colored hydrangeas, they will tend to bloom blue if the pH of the soil is low, or acidic. You can aid this process by adding a splash of pickle juice to your watering can. But the blue only shows up if there is also aluminum in the soil, which may require the addition of aluminum sulphate. If you have more alkaline soil, they will bloom pink (add lime to help). If your copper pots have tarnished, set the bottom of the pot in a pan of pickle juice for 15 minutes. The tarnish should come off easily thanks to the acidity. Some people use apple cider vinegar to easily trap the critters hanging around their gardens, but if you don't have any, pickle juice works in a pinch. 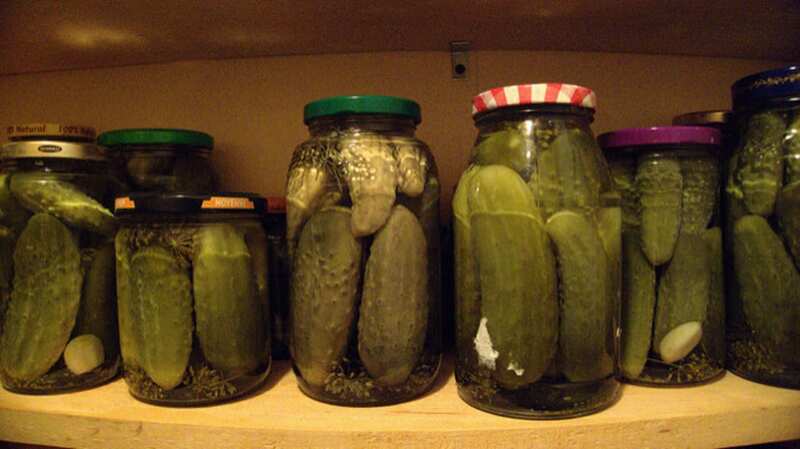 Use a small container of pickle juice with a drop of liquid dishwashing detergent in it. The vinegary brine attracts the flies, and the soap makes it difficult for them to escape.